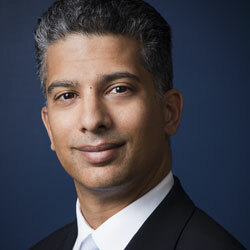 Dr. Pramod Puligandla is a surgeon, pediatric intensive care specialist, Program Director for Pediatric General Surgery, associate professor at McGill, husband, badminton fanatic, and wine geek. Well, not quite a wine geek, but close. During this interview he did wax poetic about the tastiest and most expensive wine he ever tasted, a ‘phenomenal’ 1985 Chateau Margaux. But more about that later. Dr. Puligandla is a busy guy. In fact, he is one of only two physicians in Canada practicing as a pediatric surgeon and pediatric intensive care specialist. To top it off, last July, Dr. Puligandla became the Program Director for Pediatric General Surgery which means he takes responsibility for and mentors the physicians training to be pediatric surgeons. Dr. Puligandla didn’t always dream of picking up a scalpel. Originally he wanted to be a pediatrician. But when he was doing a surgery elective as a 2nd year medical student he fell in love with it and decided then and there to combine his love of pediatrics with his love of surgery. Another part of the challenge is that much of what pediatric general surgeons do is urgent, or semi-urgent. The MCH’s four general surgeons perform approximately 1500 surgeries a year. While on call they might have to come in to hospital in the middle of the night or the middle of Sunday dinner. Dr. Puligandla admits it can have an impact on family life. But his wife understands that he is pursuing his passion. And his kids can still pick him out of a line-up. To maintain his stamina and concentration Dr. Puligandla also has a few passions outside of the OR and PICU. He plays badminton two to three times a week to stay fit and to de-stress. He is also into wine tasting. Ah, yes, the wine geek issue. While he maintains he is not a wine geek, Dr. Puligandla does admit to owning a wine cellar and to hanging out with a few wine fanatics. Every month or so, he gets together with a few close friends who truly appreciate the beverage to share a good bottle of wine. The most precious bottle in his cellar is a 1997 California Cabernet that he bought the year he got married. The wine is still aging and so he is saving it for a special occasion, maybe his 15th wedding anniversary. Dr. Puligandla says it is uncanny how your sense of taste and smell evolve allowing you to appreciate the subtle differences between one bottle of wine and the next.